I remember when you first launched your daily talk program throughout the country. My wife and I have watched with amazement as it has grown. I know you have been gratified by its broad acceptance and popularity. My wife Betty and I have been praying for you since Gene Self (my former staff member and close friend of Stedman's) began to tell me about the relationship you had with his friend. On numerous occasions I thought we were going to be able to get together and just talk based on comments Stedman made to my associate. This never occurred, but we have watched your television programs and especially the talk format grow until they have worldwide impact. Betty and I also host a daily television program, LIFE Today (http://www.lifetoday.org/), which airs around the world. I also founded the ministry of Life Outreach International. With the help of countless supporters, Betty and I have been sharing the life and love of God in word and deed in the U.S. and abroad. We focus heavily on Africa, feeding more than 400,000 children each month and drilling hundreds of fresh water wells. I am writing out of a sincere love and concern for you. 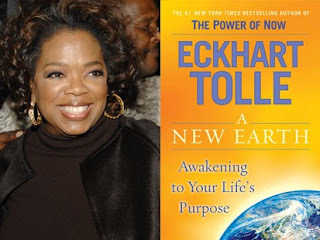 I have heard some comments recently, visited the "New Earth" and witnessed the influence of Eckhart Tolle. Some of your statements concerning your beliefs and the direction you are going actually brought tears to my wife's eyes. She was stunned to hear your views of Jesus Christ, eternity and the Bible. You are a true example of the opportunity and success that America offers people who have had difficult challenges. I can relate, because I am the product of a forced sexual relationship on a 40-year-old woman. As I child, I spent time in a foster home, then with my birth mother and a stepfather who could not read or write. Later, my violent, alcoholic father came back into the picture. It ended when I pointed a gun at him in self-defense as he threatened to kill me. By the grace of God, I did not have to pull the trigger. A couple of years later, I committed my life to Christ and God changed me, established my life, and gave me a future. My wife Betty and I recently celebrated our 45th wedding anniversary. We have three children and 11 grandchildren. We have witnessed the vast influence you have been afforded. There is no question that you sincerely care about people. Your outreach in Africa and your personal response to the suffering you have seen reveals your genuine interest in the well-being of others. I believe you truly care about others. You have become popular because you shared your own challenges, your own questions and your own failures. You have shared your battle with weight and tried to help people improve their own health. Anything that helped you, you passed on. I appreciate that. I sense that you believe in God and want the best for all His people. What breaks my heart is that somehow we, as Christians, have failed to effectively communicate the greatness of our God to you. I cannot express how much I want you to fully experience the grace that God freely shares through Jesus Christ, as well as the supernatural enabling He provides "to live appropriately and victoriously in the now," as you eloquently put it. We both know that life can be difficult, but God Almighty has provided a helper through the person of His Holy Spirit to walk through the valleys and also enable us to experience success without our gain becoming idolatrous addiction. He offers us the very things that you claim to be discovering in a mind-boggling journey wrapped in New Age philosophy and relativism. The Apostle Paul warned against the human tendency to justify ungodly ideas by "changing the truth of God into a lie" and allowing our own appetites and desires to control us rather than the proven principles of the Bible. Here is my great concern. You have obviously seen good Christians whom you admire, such as CeCe Winans and Nicole C. Mullen. I know both of these wonderful women and I am sure they shared the reality of a personal and deep relationship with Jesus Christ. But where have we, as Christians, either in our prayer life or in our example failed to connect with you and inspire you so you could see Jesus as He really is? Many have seen limited portraits of God, such as the extreme suffering depicted in Mel Gibson's The Passion of Christ. But you may not have been able to see the power of the comment Jesus made to his mother when he fell beneath the weight of the cross in that movie. He commented, "Mother, I came to make all things new." Oprah, He is the one who enables us to rightly live in the now. Only Jesus Christ can free us from past problems, present pressures and future pursuits that can become idols. Rather, we look back on the past, thank God for the lessons we have learned, trust Him for grace to deal with painful experiences, and provide present abiding power to count it all joy when we face temptation and trials, knowing that He will walk with us not only in the presence of our enemies and accusers, but even through the valley of the shadow of death. He is our ever-present spiritual and personal Shepherd. Think about this: He said it was necessary to leave and send "another of the same kind" -- the Holy Spirit, His Spirit living in us in order for us to live life fully and freely. Surely you have seen the reality of this eternal truth. The fact is He not only covers the past and provides for the present, but He also promises to secure our future. We are, in fact, eternal beings. We are not creatures of the day. It breaks my heart to hear you say that a sentence from your pastor concerning God being a jealous God caused you to reconsider your entire belief system. You misunderstood what the pastor intended and the reality of God's jealousy. He is not jealous of us, He is jealous for us in the sense that He does not want to see anything foolishly captivate us and take us as prisoners. God does not want you to miss the supernatural fulfillment that He freely offers. It is like a wife being jealous not because her husband associates with other women, but because she knows that he might be captivated by a false relationship and taken away from his first love and his family. Godly jealousy is an expression of love and concern for our best interests -- not a petty human emotion of fear, but concern that we might miss the very essence of life. Oprah, you are gifted. You have been so blessed and I know you recognize and appreciate it. I believe that you want to share the best you can discover with others. But Oprah, can I encourage you to please sit down and go a little deeper and discover something that will also truly enable your friend Eckhart Tolle and others caught up in his teaching to see that God has given us Himself in the person of Jesus Christ, who not only lived and died, but now through the power of His Spirit is available to live in us if we open ourselves to His indwelling presence? This is not mere religion, it is relationship with the living God and an unconditional love for others. You are an honest seeker and sincere in your desire to help others. Please give us as Christians another chance to clearly communicate the matchless, amazing grace of our great God and give Jesus, the One who has never in any way failed, the opportunity to become the fullness of life for you and those you care about. He will enable you to deal with the past, live fully and meaningfully in the now, and secure your future, so that whatever challenges may come, you will have a Friend and Father who never leaves or forsakes you. As believers, Betty and I are praying for you and encouraging every person with faith in Jesus Christ to lift you up in loving prayer before the Lord. You are a special person and it is my prayer that you not miss anything God has to offer. I pray that your journey will inspire all of us to examine our lives and become more consistent, compassionate, effective witnesses for Christ. Perhaps each of us as Christians should feel some weight of responsibility for not more effectively demonstrating the great message of hope found in Christ. Those who have a personal relationship with Jesus Christ will never be disappointed in Him. God loves you so much, as well as everyone you sincerely seek to inspire. About the author: James Robison is the founder and president of LIFE Outreach International, a Christian media ministry and mission relief organization. He and his wife, Betty, host of the television program Life Today; He has authored numerous books, including The Absolutes: Freedom's Only Hope and True Prosperity.